The Technicolour Floral blanket pattern is now here! 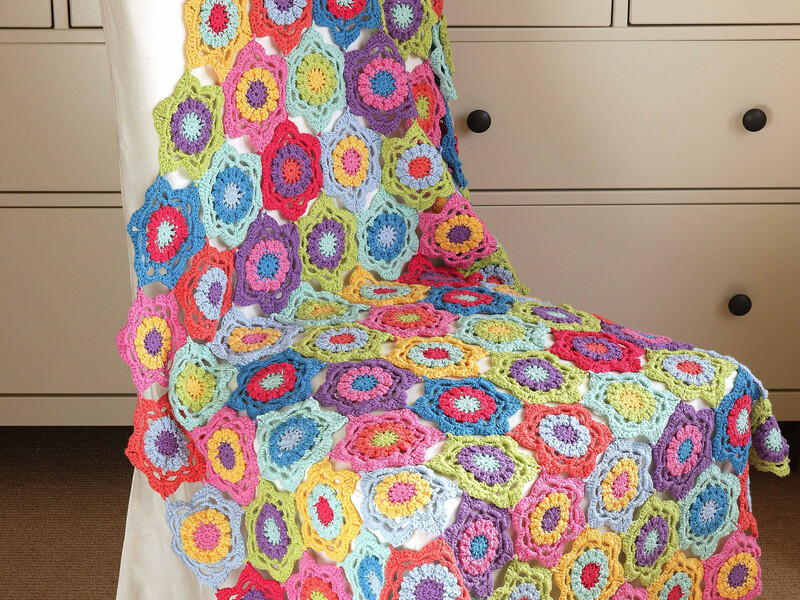 Get ready to start crocheting your very own colourful blanket. For £54.99 you will get all the yarn you need for this wonderful blanket. Keep scrolling for our handy How-To guide for crocheting and joining your floral motif. Foundation: To start off the the motif, using a 3mm hook, use the magic ring technique. To do this, wrap the yarn around your index finger once. Leaving a long tail, insert hook into yarn around finger. Take working yarn over hook. Work 1 chain (ch), to do this take yarn over hook and pull through loop. Work 12 double crochet (dc) in the ring. To do this, insert hook into ring. You will now have two loops on hook. Take yarn over hook and pull through both loops on hook. You have now made one dc stitch (st). Repeat a further 11 times, making 12dc in total. Complete the ring with a slip stitch (slst) in the first dc. Work 1 treble (tr) in the next st.
To do this, take yarn over hook. You will now have three loops on your hook. Take yarn over hook again and pull through two loops. Take yarn over hook again, and pull through remaining two sts on hook. Work 1ch, and repeat referring to the pattern. Second round: Join in the second colour to any chain space (chsp) and 3ch. Work 2tr in the next st.
Work slst in the same st.
Work a slst in the next chsp. Repeat round referring to pattern, ending with 12 petals. Third round: Join colour to 2nd tr (counting from right) of any petal and 1ch. Work 1dc in same place. Insert hook into st and take yarn over hook. Take yarn over hook and pull through the two loops on hook. Work 1dc in top of the next petal (again this is the second tr from the right). Repeat this referring to the pattern. Ending with 12 chsps. Fourth round: Work two slsts the next chsp. Then work 1ch and 1dc in same place. Work 1dc in next chsp. Repeat round referring to the pattern, ending with 12 chsp. Fifth round: Work a slst in next chsp and 1ch. Then work 2dc,1 half treble (htr) in next chsp. To work htr, take yarn over hook and insert into chsp. Take yarn over hook and pull through all three sts on hook. Work 3tr in same space, then work 3ch. Then work 3tr, 1htr and 2dc in next chsp. Repeat the round referring to the pattern. That's your floral motif complete! To attach the motifs together to create the blanket, it is best to work the final round and attach to the other motifs, as you go. To do this, work half of one petal. Work 1ch, then slst to chsp of motif to be joined. To do this, insert hook into the chsp and take yarn over hook and pull through all loops on hook. Work 1ch, and then complete the rest of the petal. Complete the rest of the round. Work the sequence of colours and rows of floral motifs referring to the pattern. Don't forget to like our Facebook page The Knitting Network and you can still share your progress over on the exclusive Facebook page for all of our Crochet-A-Longs.